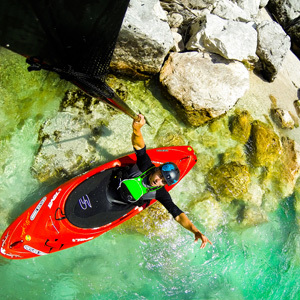 Mike Dawson first made whitewater headlines as a 17-year-old in 2004, when he rocked up to the stunning Wairoa River near his home town Tauranga for the annual Wairoa Extreme race. He’d discovered the sport a couple of years earlier and had gone into the Tauranga Boys’ College production line of talented paddlers but when he blitzed some of the best whitewater specialists on the globe to win on the Wairoa, people sat up and started taking notice. Since then, he’s created a string of competition highlights, both in the Olympic slalom discipline and in extreme racing. He won his first Oceania slalom championship in 2007, finished 21st at a World Cup in Slovakia in 2009 and in 2011, became the first New Zealander for the best part of 20 years to make a World Cup slalom final by finishing 10th in Slovenia. In September 2011, Mike became just the fourth New Zealander to qualify for the Olympic Games, joining Donald Johnstone, Owen Hughes and Luuka Jones.